Common Green Shield Bugs (Palomena prasina) are regular garden inhabitants in the southern part of the UK but are very very good at hiding thanks to their brilliant camouflage colours. On seeing this one - because it crawled on my hand as I squeezed the scented leaves of a huge 'Attar of Roses' pelargonium planted outside - I immediately thought, "Where's Wally?" Remember those books? I could never find Wally with his red and white striped hat and jumper among all the hundreds of other people in the cartoon. I carefully manoeuvred this little guy off my hand and back onto the plant - although they're sap sucking insects, they don't do any significant damage in the garden so it's okay to let them be. Their relatives, the Southern Green Shield Bug, on the other hand, will be found on runner and french beans and, as I found out the summer before last, on tomatoes. I had the immature bugs across my entire crop in the warm summer of 2014. They didn't appear to do much damage, just the occasional nibble into my fruits. Apparently both types of Shield Bugs (known as stink bugs in the US) are gradually moving northwards to colonise gardens in the Midlands and beyond as our weather becomes more temperate. They're regular visitors to my veg patch - do you see them where you live? My life as a blogger occasionally takes me to some curious places. One evening last week, for example, I found myself sipping tea in the company of Harry and David Rich. Who they, do I hear you ask? Only the brothers who won gold at Chelsea last year with their garden - and shack on tracks - for Cloudy Bay! 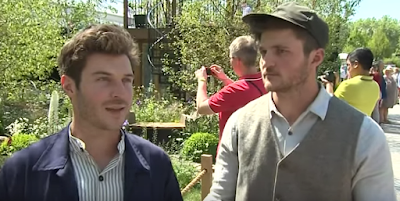 The personable duo's landscaping business was already keeping them busy but winning at the Chelsea Flower Show two years on the trot augmented their rise to fame and, in the past couple of years, the brothers have been quietly raising their game. As well as business projects, there was a garden installation for Saatchi's Chanel exhibition, a regular television slot on ITV's This Morning, filming with Charlie Dimmock (remember her?) to make Garden Rescue (there's just time to catch it on BBC iplayer) and now ... a collaboration with Australian tea company T2. 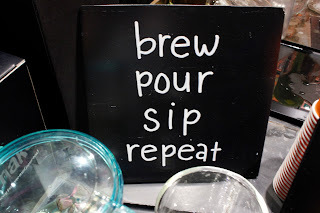 It was the tea connection that got me involved. I received an email inviting me to an 'urban gardening event' in Chelsea's Kings Road. 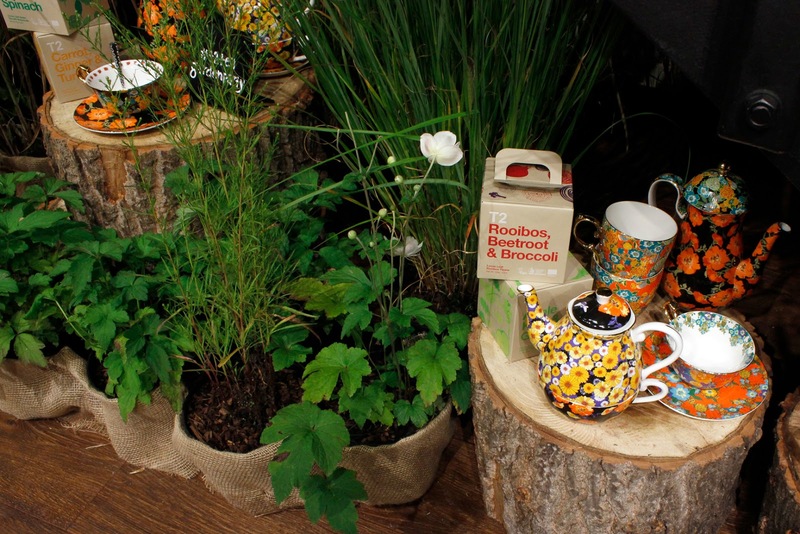 Intrigued, I asked for more details and learned that T2 were launching a limited edition range of veg patch teas with an in-store autumn garden created for the event by the Rich Brothers. Now we've all come to terms with fruit teas, herb teas and iced tea but vegetable tea? Visions of cabbage water were conjured up in my mind. I felt I should investigate - and I was very curious to see this autumn garden created by two luminaries of the gardening world. I was pretty sure that the new Veg Patch teas would be delicious - what would be the point otherwise? - and I was right. If you drink juiced fruit and vegetables every day (which I do), the flavours look very appealing. Of the four flavours Carrot Ginger & Turmeric was my first choice with Apple Kale & Ginger a close second. There are two more flavours: Green Tea + Spinach and Rooibos Beetroot & Broccoli. In the last two flavours, the green tea and rooibos were the dominant flavours but tweaked into deliciousness by the addition of red pepper, lemongrass, coriander and lemon verbena. I love the concept of using herbs and vegetables to make tea. I guess most of us have dabbled with freshly picked herbs of peppermint, lemon verbena, ginger and perhaps thyme (good for sore throats) but I would never have thought of adding dried vegetables. It makes a lot of sense when considering the health benefits of the ingredients used - turmeric is a great anti-inflammatory, kale and spinach are great for boosting energy, broccoli is a cruciferous vegetable with great anti-carcinogenic properties. So not only are the teas extremely pleasant to drink (and can be served hot, chilled or mixed into cocktails), they're also good for you. I'm sold - and we gardeners are fond of a cup of tea, are we not? Perhaps my expectations were too literal. The planting was undoubtedly gorgeous, consisting of several groups of plants in large pots and planters. It was autumn inspired with several myrtle shrubs for their delicious scent, Pennisetum grasses for that gorgeous autumnal golden/pink glow and various Sanguisorbas to bring a berried burgundy to the display. I gleaned all this from chatting to the two Rich brothers who, incidentally, are charming, funny, entertaining, chatty and very polite. It's heartening to see that success doesn't seem to have gone to their heads. I worked lots of questions into the conversation but the main one had to be, "Builder's tea or Veg Patch tea - which would you choose?" 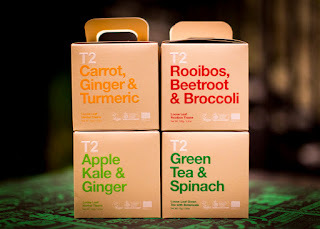 And their answer, genuinely, was that they really like T2 teas, especially the Veg Patch ones. And on that, we agreed. Veg Patch teas are a limited edition range and can be bought from T2tea.com at a cost of £16 per box. Londoners can see the garden installation at the Chelsea store in the Kings Road until early October. As the summer slowly transitions into autumn, is it all doom and gloom? No, not at all. In fact it's almost a relief that I no longer have to think about where to squeeze in a few more plants and can start to think about preparing for the winter garden and planning for next year. I may have felt slightly deflated at the lack of blooms in my last post but that just shows how wrong I was to focus purely on the floriferous feel of the garden. High spirits were swiftly restored within a few days by the evening plot pickings. 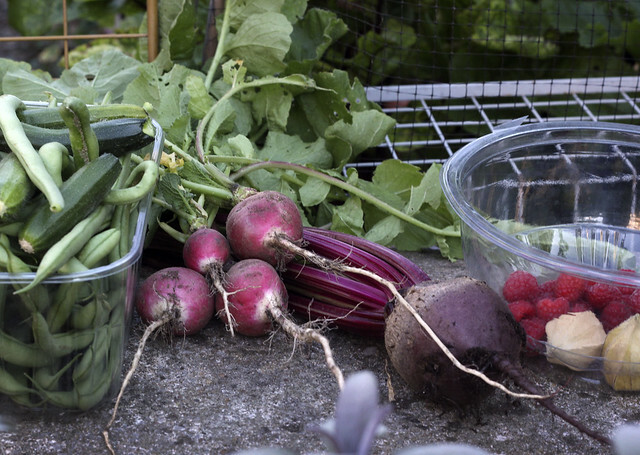 As with most other veg gardeners, I'm currently able to collect beans, beetroot, chard, radishes, raspberries and Cape gooseberries (delicious but few!) most evenings. As this is small space gardening, I don't get trug loads of produce but tiny tastes are definitely better than none. We've not done too badly this summer; there's usually enough for me and my occasional helper to have a bowlful of beans and raspberries every week at the moment - and plenty of beans and plot courgettes to hand round to a few neighbours. I like to share when I can, there would be no joy in keeping it all in the freezer for myself. So far I've restricted myself to picking only the 'french' beans that I'm growing and saving the Borlotti beans to plump up. 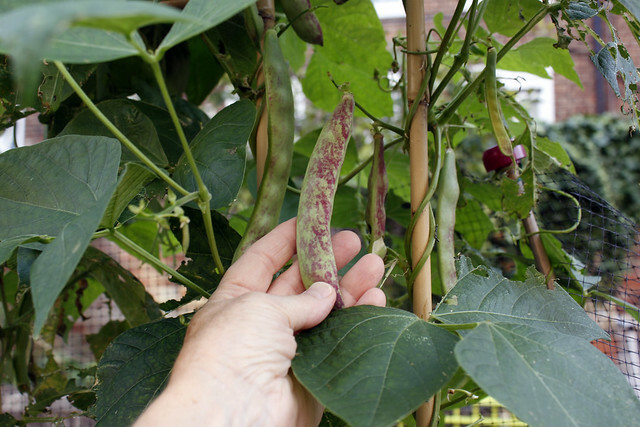 I'm growing 'Cobra' climbing beans which are aptly named; they're normally pencil straight but, where I've missed a few, they've grown fat and curled round on themselves - more boa constrictor than cobra but the similarity is amusing. The Borlottis, on the other hand, are perplexing me. 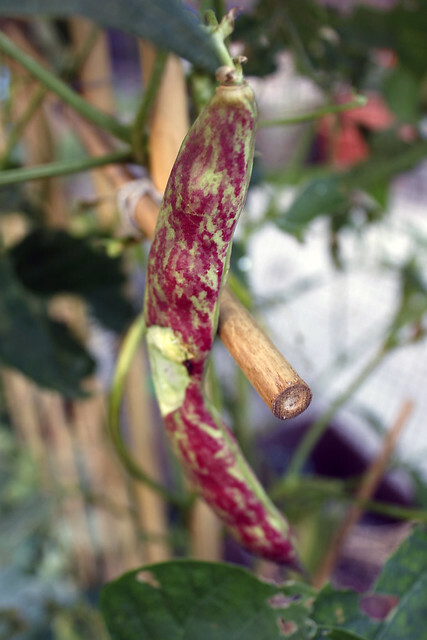 I've seen so many pictures of brightly coloured pink and cream pods - surely one of the reasons to grow them! Mine, however, are pale green pods that occasionally mature to sport some magenta streaks. Is this usual? It's definitely not what I was expecting. Will they eventually turn pink? Is there a reason that some pods are streaked and others not? If you know, do tell. Of course I may not get any mature Borlottis at all if the munching molluscs keep at it. Leaves and pods at the top of the plants have been decimated - the slime trails tell their own story. I mean, really, six feet off the ground - the very cheek of it! This is one of the tinier munchings - there are pods that are positively naked on the other side. Grrr. There aren't so many bees in the garden now - compared to the height of summer. But a steady drone on a warm still evening is very heartening to hear. The lavender bushes have only a few fresh flowers now but the bees are still finding what's left, as well scabious, comfrey and herb flowers. The top favourite at the moment seems to be verbena - I have both V. bonariensis and V. hastata growing among the veg here. The taller V. bonariensis is a bit of a nuisance as it's getting slightly floppy but well worth it for the pollinators it's attracting to the garden. Yesterday evening here in London, the warm and still evening air could almost make me believe I was holidaying in the Mediterranean somewhere. I hope the weather is being kind to you wherever you may be gardening this week! As the garden transitions from summer into autumn, a plan to keep the garden looking lovely for a bit longer has been much on my mind. And never more so than the week before last as my entry for Camden in Bloom was shortlisted and judgement day was on the Friday. It was a singularly underwhelming event. The big clue is in the title: "In Bloom". 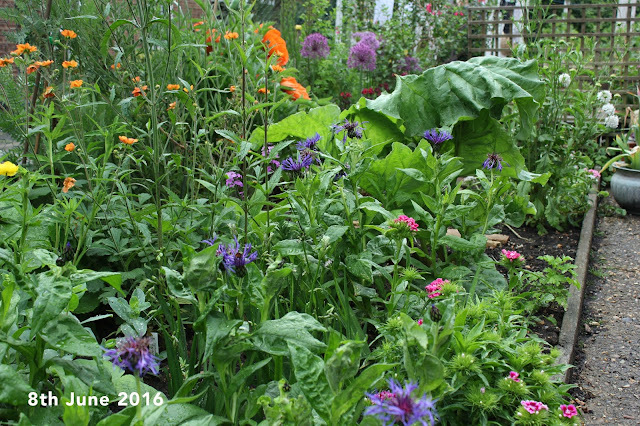 The veg patch garden, at this stage, was not - unless you count a struggling scabious, some scraggy calendula and a few end-of-line sweet peas. After an exhausting week of tidying, deadheading, weeding and planting in the twilight hours between work and nightfall, Friday's dawn revealed grey skies and, as if scripted, heavy rain poured down only and exactly for the twenty minutes that the judges looked around. There were two of them (one admin, one Mayor), the third wasn't able to attend; pity - he was the gardener, Kew trained, and the only one who might have understood the hard work that went into creating a garden way past its mid-summer heyday. On the plus side, the mayor appreciated the smell of herbs such as Blackcurrant sage and lavender, lingering awhile to release the scent. 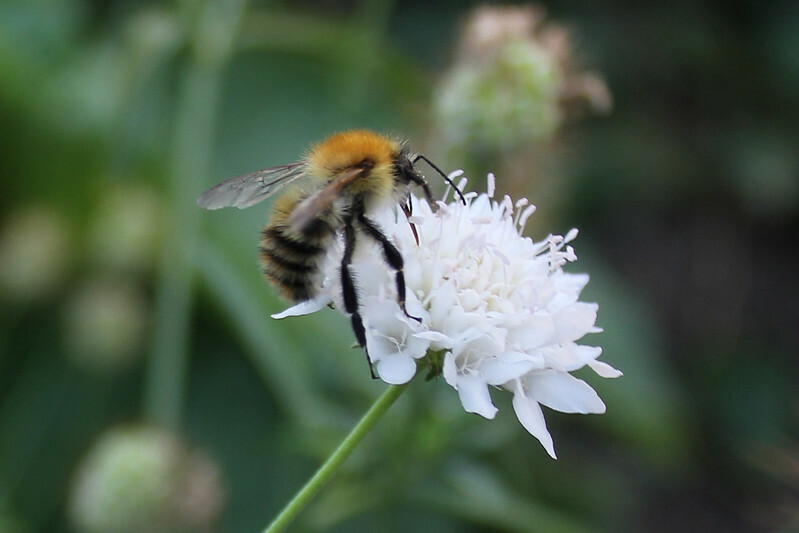 He'd obviously been told that plants that attracted bees were good plants; once I realised this and the sparse horticultural experience the pair brought to the event, I thought it wise to limit myself to pointing out any bee friendly plants without naming them. I'm not holding my breath for a winner's medal. The verdict will be announced in late September. So, moving on, I'm now thinking about how to extend colour in the garden next year. The perennial patch was originally created as an area for cut flowers before I realised how many perennials or self-seeders I had to rehouse. 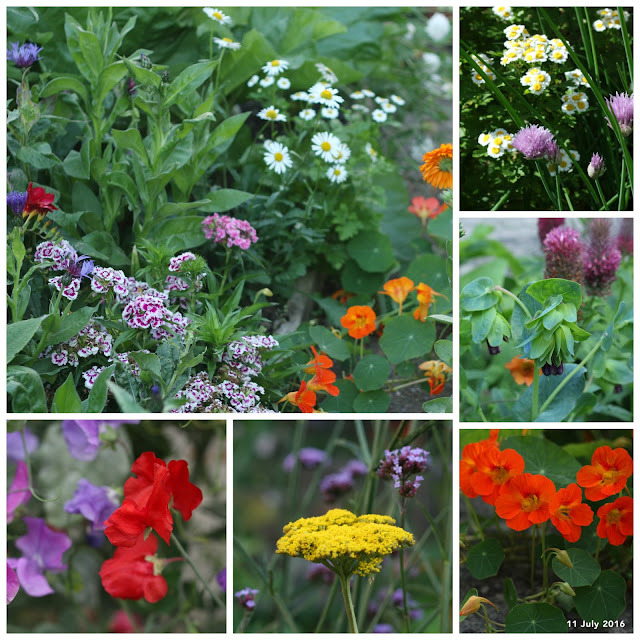 Back in the spring, the space quickly filled with transplanted foxgloves, verbenas, Centaurea, scabious, alliums, achillea, astrantias, poppies, feverfew and ox-eye daisies; to these I added freesia bulbs, cerinthe seedlings, honesty, red clover, Geums and Dianthus barbutus (the tall pinks). On the other side of the path, self seeded nasturtiums put out triffid-like branches that entwined themselves up, around and through sweet peas, calendula, strawberries, verbena, orache. It was a glorious sight ... in June and July. Admittedly the short sharp bursts of extreme heat experienced in recent weeks haven't helped a garden without easy access to water. Astrantias and the shorter hybrid Achilleas succumbed to parched conditions and now resemble dried flowers, the cerinthe also crisped up and set seed, as did the calendulas. Even nasturtiums that usually politely wait until late summer to start taking over the garden have exhausted themselves and been swamped by black aphids (and now removed). But ... Always look on the bright side of life says Monty Python star Eric Idle. I paused, thought and concluded that, yes, this is the perfect time to review and rethink. 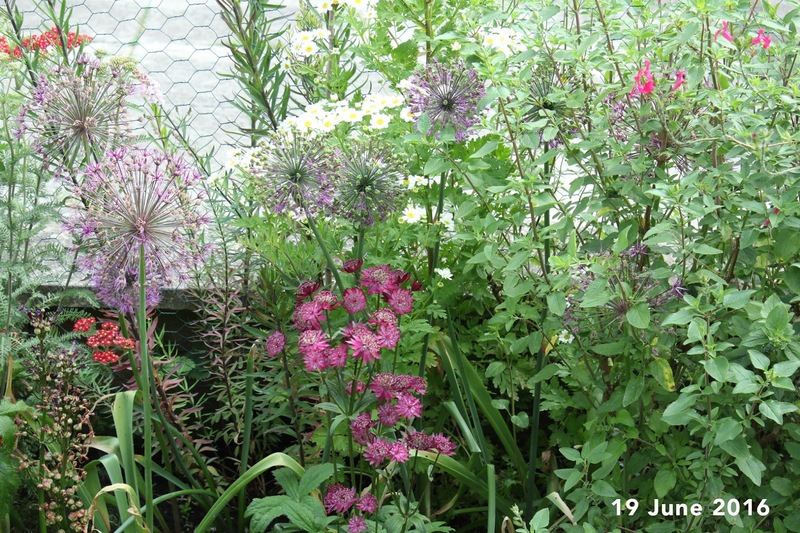 There were elements of this border that I really disliked, too much green of a similar hue, not enough textural interest. The reality didn't live up to the dream. The challenge now is to change the garden so there's something to look forward to throughout the seasons - isn't that what we all strive for? It won't be easy in this small space (the entire veg patch island is only 10 x 3 metres (about 33 x 10 feet) with the perennial border just one quarter of that. Thinking cap on. 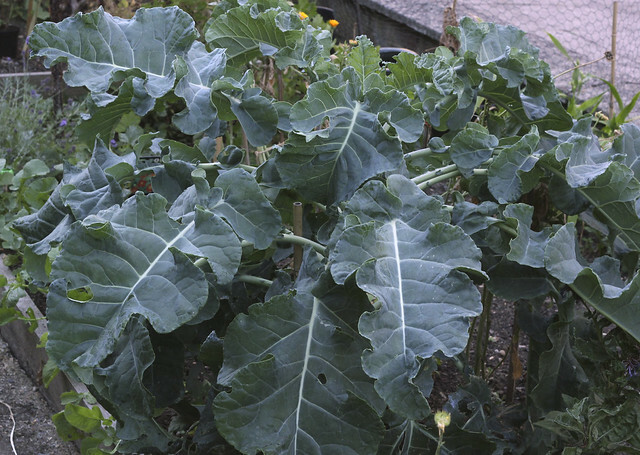 So, how's your garden this autumn? Any regrets, mistakes or ideas for change next year? I'm thinking more Stipa grasses and echinacea here - and I'd love a bank of Heleniums if only the slugs didn't get there first, every. damn. time.